Below are some common questions we have received from our customers. If the information below does not answer your questions, please use our contact form to send us your inquiry. Ans. RamaDBK was established in 1988 by Jagath C. Ramanayake. For further details please see our Corporate Overview page and Facts and Figures. Q.2. How do I contact RamaDBK? Q.3. What are the office hours of RamaDBK? Please note that we are closed on Sundays and on Japanese national holidays. Please see Why RamaDBK for further details. Q.5. How do I know that RamaDBK is trusted company? Ans.Since 1998, we have exported over 100,000 vehicles worldwide. We will continue to provide high standards of service to our customers. Compared to other vehicle exporters in Japan, we only require a 50% payment prior to the shipping of the vehicle. Once the vehicle has been shipped, we request the balance 50% of the payment to be made within 7 days of the shipment, in order to release the documents and courier them to you on time. Additionally, please check our Customer Testimonial page to see what our customers say about us. Q.1. How do I become a member? Ans.Please visit our member registration request page. Enter your name and email address, then click on “Submit”. Once you click on “Submit” we will send you a confirmation email. Click on the confirmation link in the email and you will be taken to the Membership Registration page. Here you will need to fill in your details such as company name, address, country, contact number etc and set your password. Click on “Submit” to complete the registration process. Q.2. What are the benefits of becoming a member? Q.3. How much is it to become a member? Ans.A membership at RamaDBK is free. You do not need to pay anything to become a member, just go to our Customer Hub and register! Q.4. I forgot my password. How can I retrieve it? Ans.Please visit the Forgot Password page or go to the Customer Hub and click on “Forgot Password”. You will need to enter your email address and click on “Submit”. We will send your password to the email address registered with us. Q.5. Do I have to become a member? Ans.Membership is not required to view our stock and search vehicles. However, if you would like to see the prices and mileage, we recommend you to become a member. Q.6. If I subscribe for the newsletter, do I become a member? Ans.No. You will only receive emails regarding ongoing campaigns. You will not be able to view the vehicle prices and mileage even if you subscribe for our newsletters. If you wish to become a member please visit our Customer Hub and register. Q.1. How many vehicles does RamaDBK have in stock? Ans.We have thousands of vehicles in stock. We also have access to purchase over 50,000 vehicles per week from Japanese auctions and from local dealers island wide. Q.2. What are the conditions of the vehicles? Ans.Each vehicle purchased from the auction has a grading for the exterior and interior. 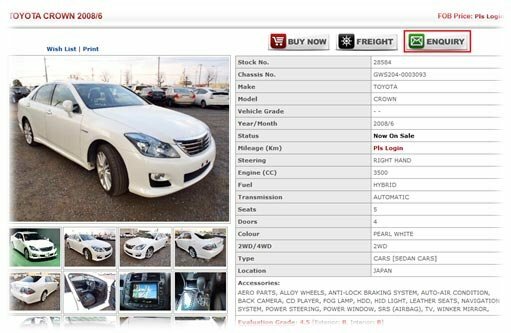 When you click on the desired vehicle you will see the evaluation grade. This grading indicates the condition of the vehicle. Q.3. How can I inquire about a vehicle? Ans.Once you have found the car that you are interested in, please click on the vehicle image or on “details and photos”. This will take you to the detailed page of that vehicle and you will find all the general information available for that vehicle on this page. An inquiry form will appear. Please fill in all necessary fields with your inquiry under message. Finally, click on Submit Inquiry. One of our sales coordinators will get back to you within the next 2 business days. Q.4. How can I order a vehicle? Ans.Please visit our How to Order page for details. Q.5. Can I order by fax, email or phone? Ans.Yes, we can accept your order by fax, email or phone. For more information on how to buy, please visit our How to Order page. Q.6. How do I secure a vehicle? Ans.As soon as you have made the 50% payment of your pro forma invoice amount, please email or fax us the copy of your transfer/payment receipt with your stock number indicated. We will secure the vehicle for you and confirm your order. Q.7. Can you supply a vehicle that is not in your stock? Ans.Yes, please use the Contact Form to send us your vehicle requirements. Clearly indicate the model, year, desired mileage and if possible your budget for the vehicle that you are looking for. One of our sales coordinators will get back to you within 2 working days. Q.8. Can you supply left hand drive vehicles? Ans.Yes. However, compared to right hand drive vehicles the available numbers are low. Please send us an inquiry by using the Contact Form and clearly indicate the model, year, desired mileage, and if possible your budget for the vehicle that you are looking for. One of our sales coordinators will get back to you within 2 working days. Q.9. Do you supply vehicles from any other countries other than Japan? Ans.Yes. We currently supply vehicles from the United Kingdom, Thailand and Korea. Please browse our stock to see the available vehicles or send us an inquiry by using the Contact Form and clearly indicate the model, year, desired mileage, and if possible your budget for the vehicle that you are looking for. One of our sales coordinators will get back to you within 2 working days. Q.10. Can you change the steering conversion from right to left? Ans.At the moment No. We cannot change the steering or supply parts for conversion to left hand drive steering. Customers that wish to change the steering usually find the necessary parts from their local markets and do the conversion by themselves. Q.11. How do I know if it is the same vehicle which I ordered that has been shipped? Ans.We advertise all the vehicles with the chassis numbers and photos. The chassis number is a unique number engraved on the chassis by its manufacturer. This chassis number will be on your Bill of Lading. A Bill of Lading is a document that establishes the terms of a contract between a shipper and a transportation company. It serves as a document of title, a contract of carriage and a receipt for goods. Q.12. Can I cancel the vehicle that I purchased? If you cancel the order for a vehicle or parts, an amount of 15% to 20% of the total proforma invoice value will be charged. Depending on the shipment process (If the vehicle has been booked for shipping or already shipped.) additional charges may also be applied. For more information, please contact your sales coordinator. Q.13. Can I change the vehicle that I ordered to another? Ans.In principal this cannot be done. If you wish to change the vehicle that you ordered, you will need to cancel that order first. However, you will have to pay the cancelation charges accordingly. Once the original ordered vehicle is canceled, you can order the other vehicle. This is the most common way to transfer funds through any bank. Please see our Bank Details on where to send the remittance.Please indicate the reason for remittance as “Payment for Motor Vehicle and/or Vehicle Parts”. After the transfer is done, please email or fax a copy of the transfer slip to your sales coordinator with your vehicle stock number indicated. We accept payments online via credit cards. In order to make a payment by your credit card, please visit Online Payments. 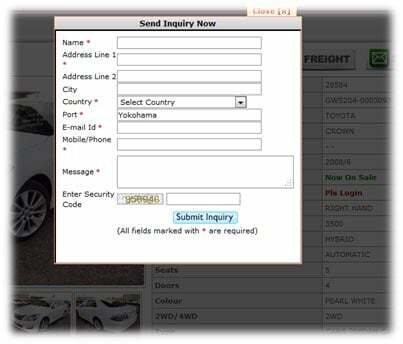 Type in the required fields and indicate your vehicle/spare part stock number under “Payment for”. Then click on “Submit” to proceed. You will be taken to the Pay Pal page. Please type in all necessary fields and finalize the payment.Kindly note that all online payments need to go through Pay Pal for security reasons for you and for us. Also note that online payments can be received in few minutes, please inform your sales coordinator by email or phone with the payment reference number to confirm your payment and to ensure quick shipment of your vehicle/spare part. We accept L/C’s depending on the country which the vehicle is to be imported to. This is mainly due to the countries regulations, and where there are no regulations on payment terms, we only accept TT’s or credit card payments. If you have any doubts, please feel free to contact us. Q.2. How do I receive a proforma invoice? Ans.Once you make an inquiry for the desired vehicle, you will be contacted by one of our sales representatives by email or by phone. When the details are finalized, the sales coordinator will send you the pro forma invoice through email. Please proceed to make the payment as soon as possible to ensure quick shipment of the vehicle. Q.3. What is the total cost required to purchase a vehicle? Ans.The total cost required to purchase a vehicle is either C&F or CIF which will be indicated in your proforma invoice. You will be required to make a payment of 50% from the total amount indicated in your proforma invoice to confirm your vehicle order and to have it shipped. Once the shipment is done, you will be required to make the balance payment and the documents will be released to you. Q.4. When should I pay? Ans.Our vehicles are sold out on first come first served basis. As soon as you received the proforma invoice, please make a 50% payment by TT or by a credit card and either email or fax us a copy of the payment receipt. We will secure the vehicle for you once the payment has been confirmed. For countries that require a L/C, please contact us. Q.5. When should I pay for the shipping? Ans.Payment for the shipping cost should be made before the shipment of the vehicle. We will only ship the vehicle once we have confirmed the 50% payment for the C&F or CIF amount indicated on the proforma invoice. Q.6. Can I pay by credit card? Ans.Yes, we accept credit card payments via PayPal. Please visit Online Payments to make a payment. Q.7. Why is PayPal used when paying by credit cards? Ans.PayPal is a fast, safe and easy way to pay online. It is the global leader for online payment solutions and offers both the buyer and seller a highly secure method for making payments online. Please visit PayPal for more information. Q.8. Which currencies can I pay with? Ans.For the convenience of our customers, we accept Japanese Yen and US Dollars. Please see our bank details for account information. Q.9. What are your bank account details? Ans.Please visit Our Bank Details page for our account details. Q.10. Can I pay by check? Ans.Sorry, we do not accept checks. You can pay by telegraphic transfers, online payments(credit cards / PayPal) or by opening a letter of credit depending on the importing country. Q.11. What are the terms of payment? Ans.Most vehicle exporters in Japan require a 100% payment to order the vehicle. However, RamaDBK only requests a 50% payment to confirm the order and shipment. Once the vehicle has been shipped, we request the balance 50% to be made within 7 days of shipment to ensure that the documents get to you on time. Q.12. How do I know I can trust you and pay you 100% in advance? Ans.We do not require 100% payment from you to confirm the order. You need to only pay 50% to secure the vehicle and one it has been shipped you will need to make the balance 50% of the payment in order to receive your documents in time. Q.13. Is there any guarantee? Ans.RamaDBK guarantees that the vehicles described on our website are as accurate as possible. However, the guarantee is not a warranty and it only guarantees the customer against the misrepresentation of the vehicle(s). RamaDBK does recognize that vehicles pass through different hands in transit to our customers (ports in Japan, stevedores loading and unloading ships, the ship’s crew, ports at destination, storage and transporters etc) and cannot guarantee that vehicles will arrive in the same condition as when inspected. Q.14. How can I get a discount? Ans.Prices online are quoted in JPY, USD, GBP or EUR. However, you are welcome to make an inquiry and negotiate. You may ask the sales coordinator for a discount and if approved by the management, you will receive one depending on the vehicle! Q.1. How long does the shipment take? Ans.The time line of the shipment will depend upon your payment and the shipping company’s schedule. Your sales coordinator will inform you the estimated departure date (ETD) and estimated arrival date (ETA) once you confirm your order. If you would like to have this information before you place an order, please ask us for the approximate delivery time for your port. Q.2. How much is the shipping cost? Ans.This depends on the type of vehicle and the destination port. Please use the “Freight” icon indicated on the vehicle description page to check the shipping cost. Or you can send us an inquiry by using the contact form or give us a call. Q.3. When will my vehicle be shipped? Ans.The estimated departure date will depend on the confirmation of your payment and the shipping company’s schedule. Your sales coordinator will keep you updated with this information, once your order and payment has been confirmed. Q.4. How can I find out about the shipping schedule? Ans.Please send your inquiry by using the contact form or you may call us too. Q.5. What is the information required before shipping the vehicle? Consignee Name & Address - information on the person that will receive the vehicle(s). This information will be indicated on the shipping documents as well. Courier Address - information on where to send the shipping documents Notify Party - the contact person at the port of delivery. Usually this will be your clearing agent. Please send us these details if you require us to inform the shipping schedule anyone apart from the consignee. Q.6. What do I have to prepare for the shipment? Ans.In most of the cases you will need to do nothing. RamaDBK will arrange the shipping on behalf of you. Once you are notified of the booking confirmation, please keep the arrival date free to go clear your vehicle. Q.7. What does Ro/Ro shipment mean? Ans.Ro/Ro is an acronym for Roll on/ Roll off. It is a specific type of service offered by the Shipping Lines for shipping vehicles only. This type of sea freight operation can be described as where the vessel is loaded using ramps, and the cargo is driven in to and out of the vessel by way of these ramps. These types of ships are like giant indoor floating parking lots that can hold from 400 cars up to 1,000 cars at once. Ro/Ro vessels can accommodate motorcycles, boats, trailers, RV’S, and heavy equipment. However, they don’t carry containers and they certainly do not carry passengers. An advantage of a Roll on/ Roll off operations are that no specialized lifting equipment is needed in either of the ports or on the vessels. Q.8. What does container shipping mean? Ans.This is a popular method of transporting goods by sea. Containers come in standard 20 foot and 40 foot sizes. Container ships are cargo ships that carry their entire load in truck-size intermodal containers, in a technique called containerization. They form a common means of commercial intermodal freight transport. Q.9. Are the vehicle checked before shipping? Ans.Yes, the vehicles are checked by our professional staff before purchasing. Once they arrive at our yards, all vehicles are re-checked by a mechanic. Once the check is completed the vehicles are washed and the interior is cleaned before shipping them out to the customer. Q.10. What shipping documents will I receive? Ans.RamaDBK will send you the below documents once the vehicle has been shipped and 100% of the payment has been confirmed. Q.1. Which documents will I need to receive my vehicle? Please note that we will only courier the above documents once the balance 50% payment has been confirmed. Kindly complete the balance 50% payment of your vehicle order as soon as the shipment has been confirmed. Also note that depending on your country’s regulations other documents may be required. Please contact your local clearing agent for further information on necessary documents. Q.2. Do I need to contact a clearing agent? Ans.Please check with a local clearing agent in your country before confirming your order with us. They will usually quote you an extra cost to bear after the vehicle lands at the port. Also they will be able to give you instructions on registering the vehicle at your country. Q.3. How can I receive my vehicle? Ans.Once you receive all documents by courier you are able to start the necessary clearing process at the port. Please consult your clearing agents at your port for further information. Q.1. What spare parts do you have? Ans.We have engine/parts, transmission/parts, suspension/parts, differential/parts, electrical/parts, body parts, accessories and others. Please visit our Spare Parts page to view the current stock. Q.2. How can I order spare parts? Ans.Please visit our Spare Parts page to view the current stock. Also you can send an inquiry about the spare part(s) you need by submitting the Spare Parts Order Form. In some cases we will need a copy of Japanese Registration or the chassis number to order parts. Sometimes without this we cannot confirm whether it will fit your vehicle or not. If this happens, please fax or e-mail a scanned copy of Japanese Registration with your order. Q.3. Can I track the package you send me? Ans.Yes, once the package has been discharged, we will inform you the tracking number and on how to track it. Q.4. Do I have to pay for the courier or freight charges? Ans.It depends. If you or a friend of yours has purchased a vehicle from us, we can ship the spare parts to you with the vehicle and then you will not have to pay for the courier charges. Please inform us if you or a friend or yours is awaiting shipment of a vehicle. However, if you are only ordering spare parts, you will need to bare the courier charges. Q.5. In which currencies can you quote? Ans.We usually send quotations in Japanese Yen or U.S. Dollars. Please use an online currency convert to check the amount in your desired currency. Q.6. How do I pay for the spare parts? Ans.Please make the payment by a telegraphic transfer or online by a credit card.